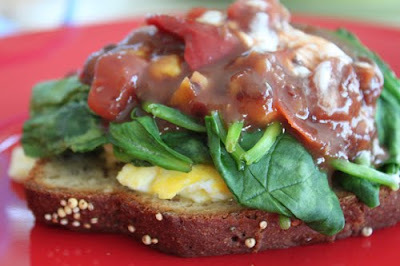 Laura Schmitt NE: Gluten Free Multi Grain Bread, Eggs, Greens, and Salsa. Gluten Free Multi Grain Bread, Eggs, Greens, and Salsa. Not just for breakfast, this fabulous combination makes a winning quick meal any time of day. In a large pan over medium heat, scramble egg, warm bread, and wilt spinach all at the same time. This meals goes together quickly. Stack, and top with salsa and a bit of Veganaise or Feta cheese/sour cream/Aioli. Enjoy! This speedy and delicious quick meal packs in over 11g of protein, 4-5g of fiber, and less than 3g of sugar. Additionally, you receive a wonderful variety of minerals and nutrients from this combination of grains, seeds, egg, and vegetables. The serving size above is actually quite small, but if served with a fresh fruit smoothie, it makes a satisfying meal. You can certainly add a second egg, more spinach, and more salsa, however. Start your day with some protein, fiber, and vegetables and try it for a week. See if it helps you feel more balanced, focused, and less starving as the morning wears on. Many of my clients tell me that switching to a breakfast like this one is a favorite aspect of changing their dietary path to one that focuses on eating for wellness. In the area? Stop by Advance Health, downtown to pick up some Multi Grain gluten free bread by the French Meadow Bakery. While you're there, say hello!